We have recreated this classic bygone world war two fighter plane. For any little boy or girl, this is a must!! With very high detail and quality. 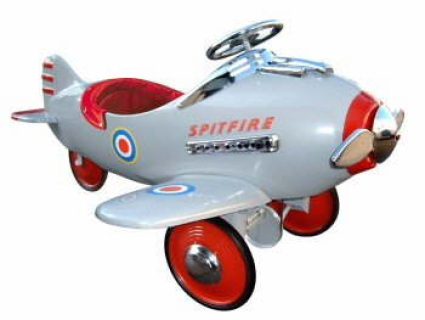 It's features include solid rubber tyres for a smooth ride and rotating propeller. When pedalled, the propeller drive band rubs against the chassis, giving a realistic engine noise!! It comes partially assembled and is shipped in a box straight to your door. Our plane is guaranteed to bring a smile to any boy or girl's face (or even an adult collector) you could just pop it on to your ceiling and it will give your friends and yourself something to talk about. Child Safety Tested And Approved.